Offering great value for money, FrontRow™ home cinema seating offers comfort and design and can now be found in a growing number of award winning home cinema installations. The home cinema chairs have many seating options from single chairs to an infinite number of configurations due to their modular design so whether it's a single chair or a row of twelve seats FrontRow™ can provide the solution. 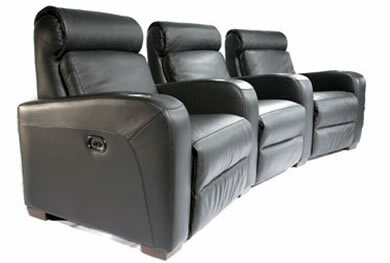 Popular configurations include two, three, four and five seater curved recliners. 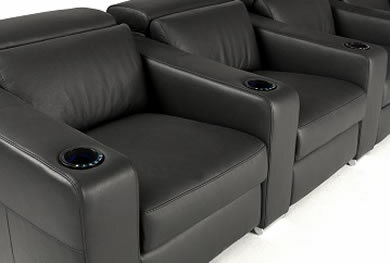 All seat modules have electric recliners and are available in full high grade leather or fabric. All home cinema seats come with a comprehensive five year warranty which includes mechanical as well as fabric and leather cover. Accidental damage is also covered which includes repair of rips, tears and scuffs as well as the removal of stains for full peace of mind. 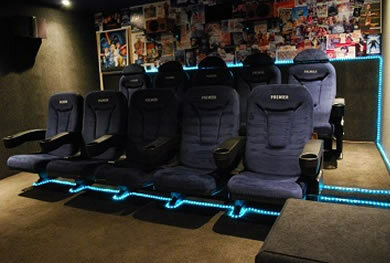 FrontRow™ Home Cinema seating is a must to help relax, unwind whilst watching your favorite movies. A range of 10 modules giving multiple straight and curved seating configurations. Available in full high grade leather, and fabric options in a large range of colours. Cup holder caps and trays are available for this range. Seat backs can be removed for those harder to access areas such as attics and basements. A range of 3 modules to create straight multiple seating configurations. Available in full high quality Italian leather and fabrics. Manual head rest can be folded down when not required. All seating controls are on the rim of the cup holder and operate the electric recliner, cup holder light, and drinks chiller. For those wanting a traditional cinema seat we can now offer a range from a leading manufacturer of commercial grade chairs which can be found in many national cinemas and private theatres throughout the UK and Europe. 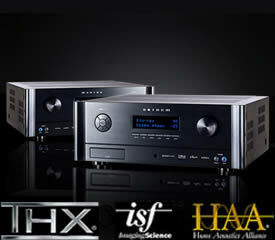 All quoted prices include VAT and delivery (mainland UK). All seats are delivered flat packed and assembly is straightforward. Fixings will be needed to bolt the seats securely to the floor. There are a number of stock colours and materials however there is an extensive range of different colours and finishes and the client's own material can be used to upholster the chairs for an additional cost. This will also be treated to meet fire regulations. Additional name plates and numbers can be also added to personalise the client's chairs for 'his' and 'hers'. Apart from the King seat all other models can be supplied as individual seats or in rows. Arms can be fixed or hinged so a love seat or longer bench seats can be created. Seat materials can also be added to the arms for additional comfort.